The recordings are stored with the video collection. Inventory available at Kazerne Dossin documentation centre. The Anna Esther Tolkowsky collection (KD_00364) contains additional photos of Anna Esther Tolkowsky, her siblings and children. Anna Esther Tolkowsky was the granddaughter of Abraham Tolkowsky and the daughter of Moise (Maurice) Tolkowsky. She married her paternal uncle Falk Paul Tolkowsky. Abraham Tolkowsky, born on 5 June 1838 in Russia, migrated from Bialystok, Poland, to Belgium in the 1880s and became a diamond merchant in Antwerp. He married Lifsche Moed and several of their nine children also became active in the diamond industry. The family business prospered from the 1890s with the founding of diamond polishing business A.M.I. Tolkowsky. Son Moise (Maurice) invented several techniques to cut round diamonds, while son Samuel (Sam) became the first chairman of the Antwerp Diamond Exchange. After the First World War, during which the family fled to England and the far East, grandson Marcel Tolkowsky, son of Israel (Isidore), developed the Ideal Cut diamond, which is still a standard in the business today. The Tolkowsky family was also very active as philanthropists. Son Chilem Salomon cofounded the general Zionist organisation Agoudath Zion in Antwerp in 1898, son Israel (Isidore) the Ezra welfare organisation in 1904 which he presided for more than 25 years. Villa Altol, a colony for weak children located in the rural area of the Kempen, outside of Antwerp, was established by the family, in honour of the deceased patriarch Abraham Tolkowsky and his wife Lifsche Moed. The colony still exists today, but was relocated to Koksijde in 1965. By 1940, only Abraham Tolkowsky’s sister Lina Tolkowsky, his grandson Charles Tolkowsky (son of Maurice) and his family, and his granddaughter Denise Tolkowsky (daughter of Sam Tolkowsky) with her husband Alexander de Vries lived in Belgium. Since they had received Belgian nationality before the war, they were initially protected from deportation. When in 1943 Jews with Belgian nationality were also deported, the family members went into hiding. Charles Tolkowsky was arrested in February 1944. When returning home to pick up the mail, his tenant, mister Haegens, called the Sicherheitspolizei-Sicherheitsdienst (Sipo-SD) upon which Charles Tolkowsky was arrested. He did not survive deportation from the Dossin barracks to Auschwitz-Birkenau via Transport XXVI, the last convoy to leave Belgium, on 31 July 1944. 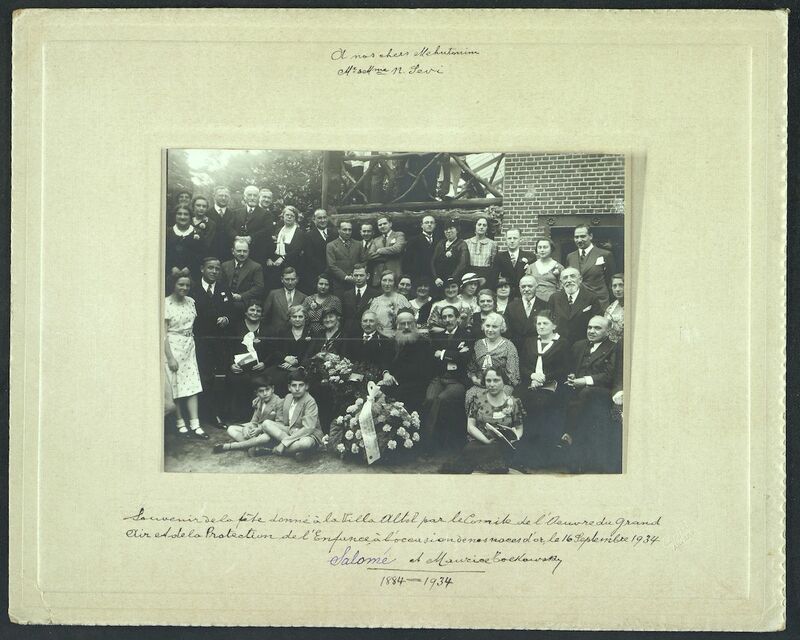 After the war, members of the Tolkowsky family, most notably Denise and Alexander, contributed significantly to the Arts and cultural life in Flanders and Belgium. The family continues to prosper as great-grandson Sir Gabriel Tolkowsky is a world acclaimed consultant in the diamond business. Today, Tolkowsky family members live all over the world. The archive was compiled by Abraham Tolkowsky’s great-grandson Sir Gabriel Tolkowsky, selecting items from a wide range of family documents. In 2015, Sir Gabriel Tolkowsky donated the archival collection to Kazerne Dossin.